Having spent some of our summer holidays in Devon, camping (or more precisely glamping) at the Smytham Manor in Little Torrington, visiting Woolacombe, Barnstaple, Weare Giffard and other lovely places nearby I can definitely say that you can’t leave until you will try some of their local specialities. There are two things you absolutely must have: Hockings ice cream (the one in honeycomb cone) and Chunk of Devon pasties that are sold in many cafes. This pasty is inspired by one I have tried on the Woolacombe beach… Chunki Roast Vegetable Pasty from Chunk of Devon. Although it was summer, those pasties are perfect all year round. To recreate them we have generally used this tried and tested Homemade Chicken & Leek Pasties recipe and only changed the filling. First prepare the filling, combine all of the ingredients for the filling, except for salt, pepper and flour, and bake on a baking tray until vegetables are ready. Set aside to cool down completely before stirring in the flour. To prepare the dough combine all the ingredients and knead for a while. To assemble the pasties take a ping pong size ball of the dough, roll it out to the oval shape and top with some filling in the middle. Bring longer sides together and seal the pasty pulling the lower layer over the top one and pinching it down while on the baking tray. Brush ready to bake pasties with egg yolk. Enjoy alone or as a side to the soup or green salad. Makes 15 large or many more smaller pasties. The filling can prepared long time in advance and placed in the fridge for best result. If there is any leftover filling, it can be used inside wraps or even as a side dish. Those Devon pasties will be reminding us for a very long time of our camping holidays, therefore I’m submitting them to our Inheritance Recipes link-up that we co-host together with Solange of Pebble Soup. 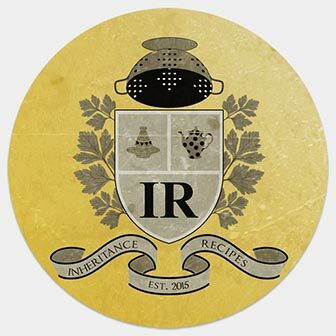 October Inheritance Recipes is hosted on Coffee & Vanilla, please come and join us! I so love your props. Recipe looks nice for the winter too. What is 7 cups of plain flour in grams? Wow! Thanks Margot, this looks so amazing. I am going to try it out, thanks for the recipe. Wow! Thanks Margot, this looks so amazing. I am going to try it out, thanks for the recipe i really appreciate it. I will feed you back after experimenting it out.